The whole philosophy of our post earthquake reconstruction approach was based on the principle of owner driven reconstruction.The vision was that we build three demonstration schools (in Kavre) and in the meantime provide skill sets to the local community, so they can build homes on their own. We can very proudly say that the Compressed Earth Brick technology we had introduced has been well accepted by the communities. Especially in the village of Hokse, Kavre some farmers have borrowed machines from our tool library and built homes in their own volition and with very minimal supervision. Nepal government has been very incompetent in providing grants for the process and components of reconstruction. They have only provided 500 USD (out of 3000 USD which was promised) for the reconstruction in which 200 USD is spent just to get the necessary building permits. A vast majority of the people are still living in temporary shelters as that money is not even enough to initiate building a good foundation. Despite this, the fact that about 20 homeowners from an impoverished community have come to build homes using our technology,is very rewarding for us. As they are making the buildings and also the bricks, they save cost, as this technology is 30 percent lesser in cost compared to conventional buildings. Despite not getting the total grant, they have almost completed the construction by funding it with their personal savings. In addition,30 other individuals have signed up for our training. We are so happy to say that we have found our early adopter in this village of Bhangeri Kavre. Saila Tamang is a young lady, who comes from a modest economic background. She was so impressed with our bricks that she employed young masons who we had trained during the construction process. The masons, hired the machine at a modest Rs. 100 (USD 1) per 1000 bricks, which we had donated to a local cooperative. She has now made 6000 bricks and is waiting for the next government installation to start her work. 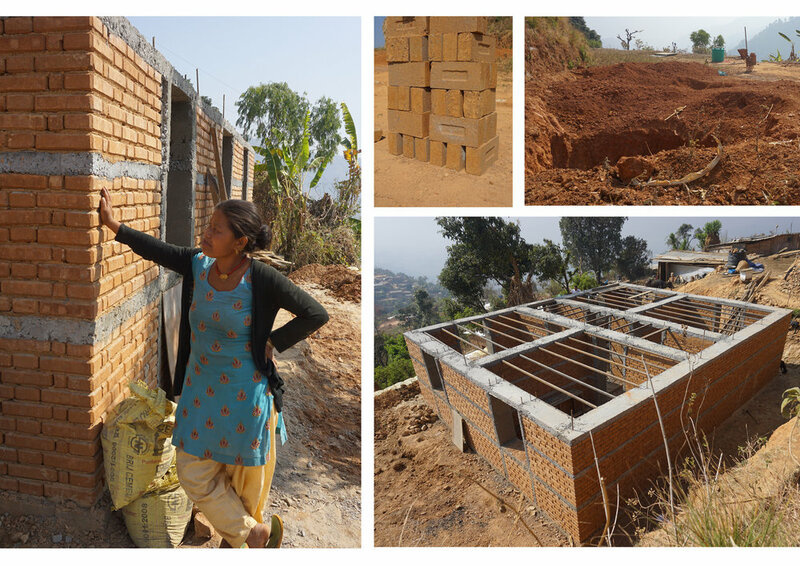 Following her practice,Resam Tamang, Keshav Hamal and Lakshman Hamal have borrowed machines from the tool library and are building their homes. Read on about our Model Village proposal here. Read more abour our Owner Driven Reconstruction Initiatives here. Watch our ODR narrative here. It has been a roller-coaster journey after the earthquake, and we are proud to have effectively collaborated with many local communities, young professionals, urban youth, policy makers and international groups in our post-earthquake activities. Machine and Techniques that brings local people of Nepal one step closer to building their own homes. The Madan Puraskar Pustakalaya is the principal archive of books and peridocials in the Nepali language. The library is a non-for-profit institution that is run by a trust. Over the last five decades, it has continuously engaged in collection and archiving of published materials in Nepali language.